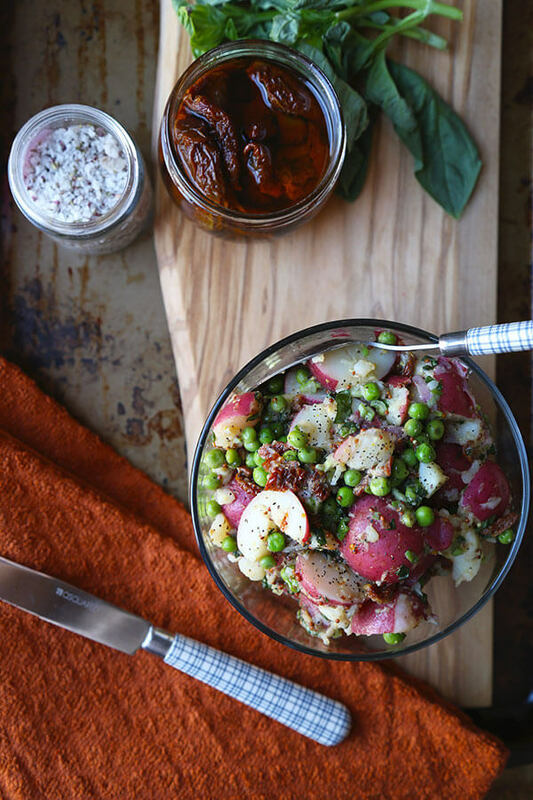 A deliciously healthy and tangy red potato salad with sun dried tomatoes, green peas and basil, tossed in a light mustard and vinegar dressing. Ready in 15 minutes! I’m half French and therefore, half potato. I can eat potatoes all day long and never get bored of them. I’ll make them for breakfast, lunch and dinner and sometimes treat myself to a small bag of chips in the afternoon. I’ll admit that my favorite preparation is the classic Quebec poutine – there’s nothing better than freshly cut, double fried French fries topped with brown gravy and melted cheese. Seriously, I can’t even think about it without starting to drool. But I only allow myself to have it twice, maybe thrice a year since poutine is one high fat-laden dish guaranteed to expand my waistline. French fries, gravy and cheese? So good but so fattening! It’s like dumping a fat tub of lard straight into my stomach. A yummy one for sure, but a bad one nonetheless. So when I crave potatoes, I bake, pan fry or boil them. Not all potatoes are bad: the truth is potatoes can be good for you if they are prepared in a healthy manner. 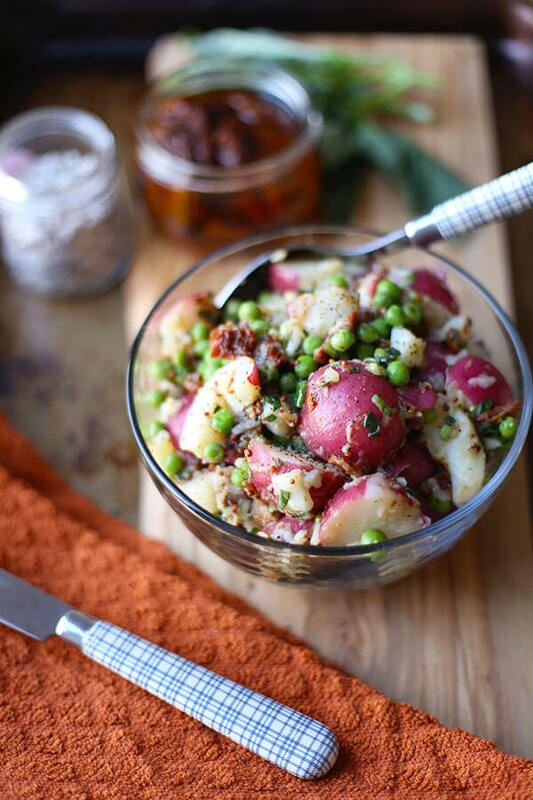 Like this healthy red potato salad, which is low in fat and contains lots of nutritious ingredients like green peas, sun dried tomatoes, fresh basil and scallions. 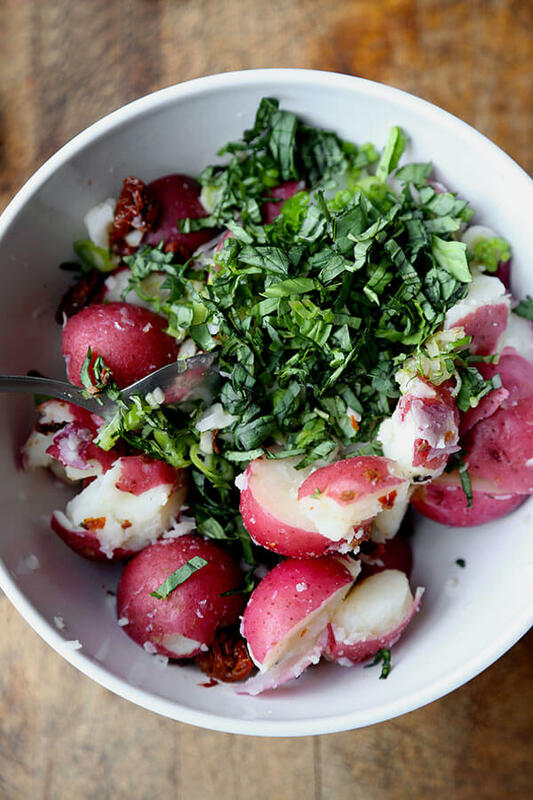 Chilled, cooked potatoes contain resistant starch, a dietary fiber that can help you lose weight. Resistant starch increases your body’s ability to burn fat, but it also fills you up and reduces overall hunger. This can greatly improve weight control since you won’t feel like you are on a strict, carrots and celery sticks diet. Potatoes also lower blood pressure and contain over 60 different vitamins and phytochemicals. Basically, potatoes are amazing and it’s no wonder why we love them so much! With potatoes, it’s all about portion control, so stick to one medium size potato per given meal. 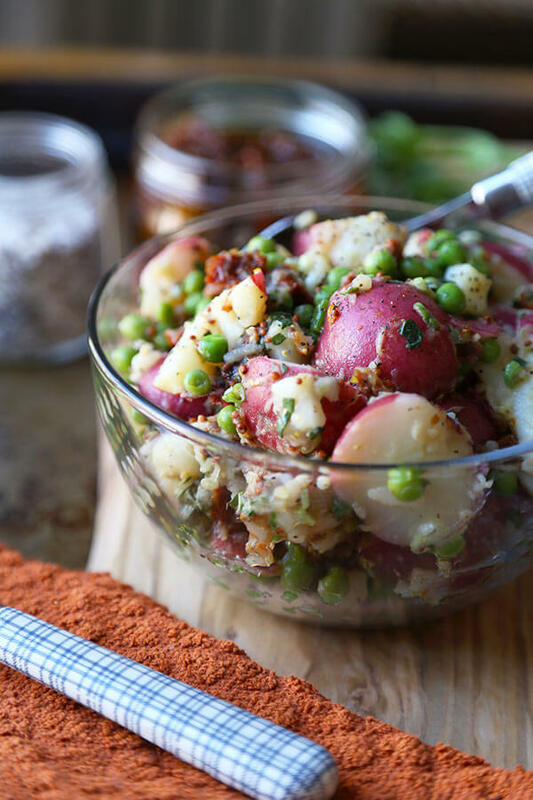 This healthy red potato salad has about four servings which will be close to the equivalent of a medium size potato per serving. 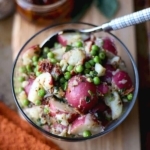 The zingy combination of grain mustard and white wine vinegar brings the dish together by enhancing the sweetness of the green peas and sun dried tomatoes. Not only is it really yummy, it’s also quite filling. 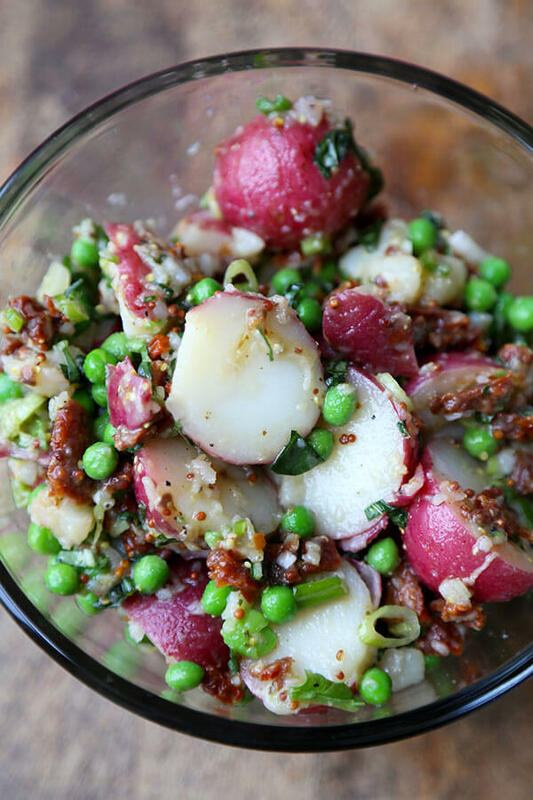 Bring this red potato salad to lunch together with a soup or sandwich and you won’t be hungry until dinnertime! 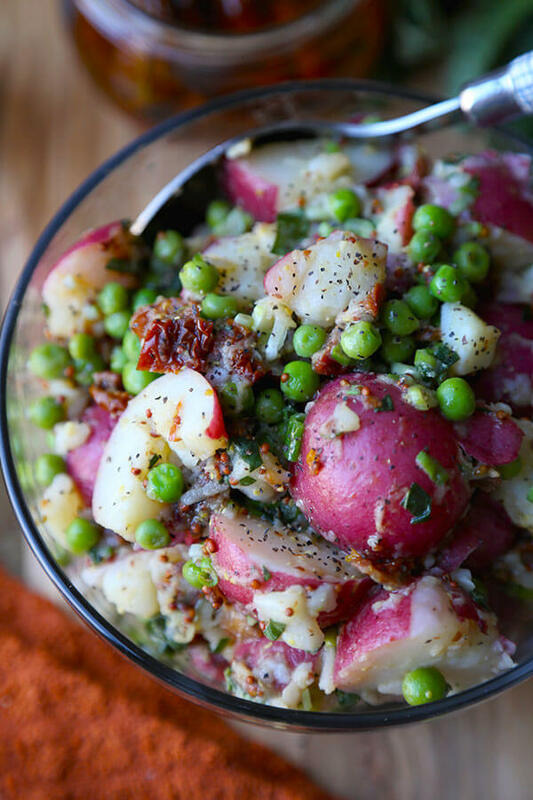 Did you like this Healthy Red Potato Salad Recipe? Are there changes you made that you would like to share? Share your tips and recommendations in the comments section below! 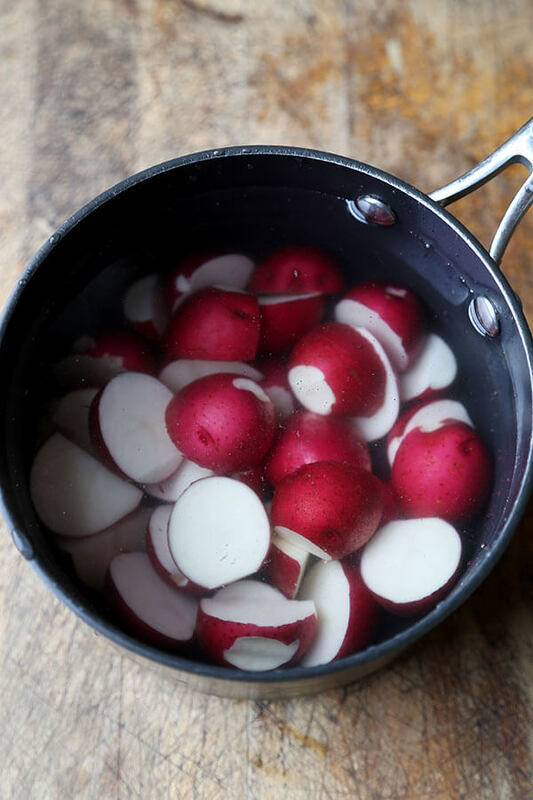 Fill a pot with water, add potatoes and bring to a boil. Cook for about 7 minutes, until potatoes are tender but not mushy. Drain well and transfer to a bowl. Very lightly mash them with a potato masher – only mash about half of the potatoes. 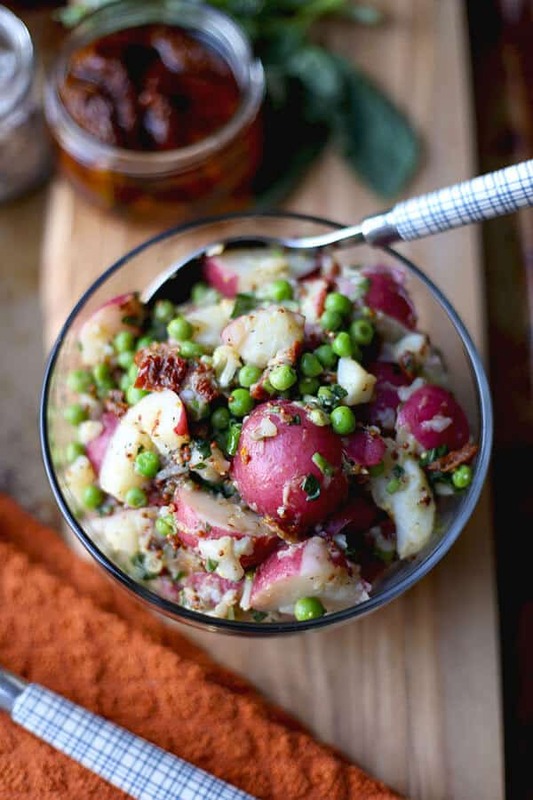 Add green peas, basil, sun dried tomatoes and scallions to the potatoes and lightly toss. 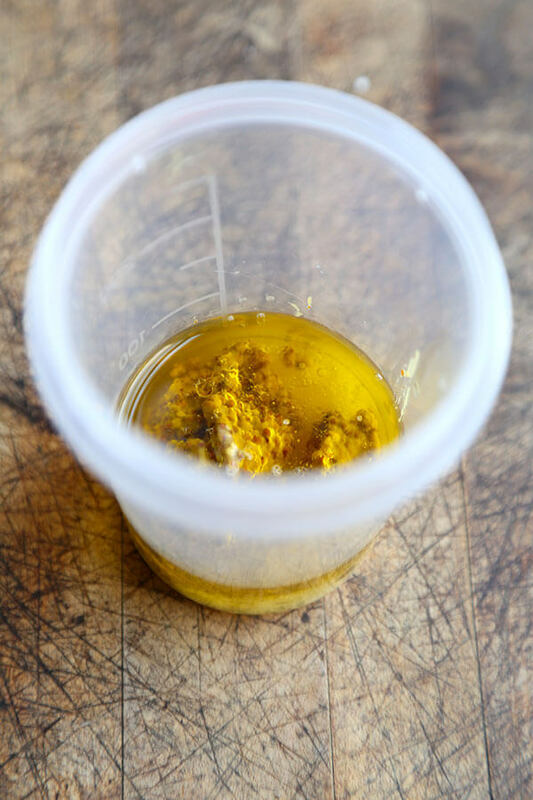 Whisk all the ingredients for the dressing into a bowl until oil has emulsified. Pour over the potatoes and toss well until they are evenly coated. Season with salt and pepper if needed and serve. 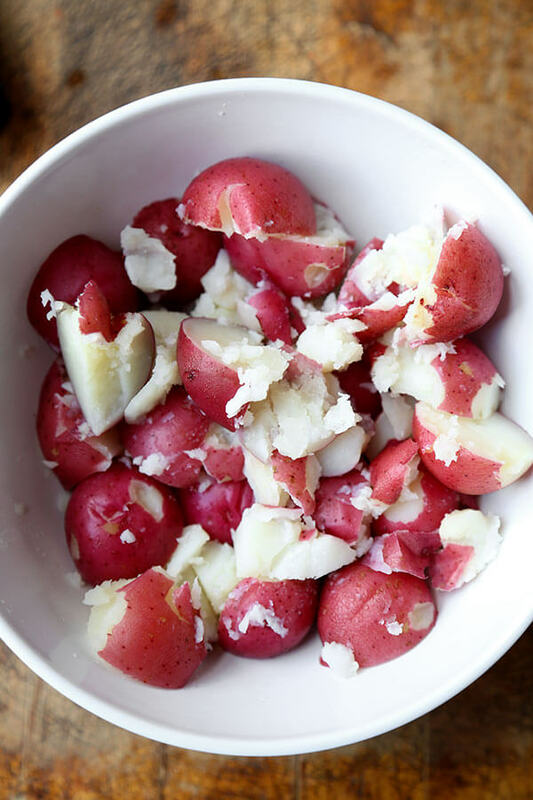 This healthy red potato salad will keep in the fridge for 3-4 days. Hi, I don’t see the green peas mentioned in the instructions. At what point do they come into the recipe? Looking forward to trying this! Jennifer, my bad for forgetting to add the green peas! I’ve added them to the instructions, they go together with the basil, sun dried tomatoes and scallions 🙂 I hope like this recipe!